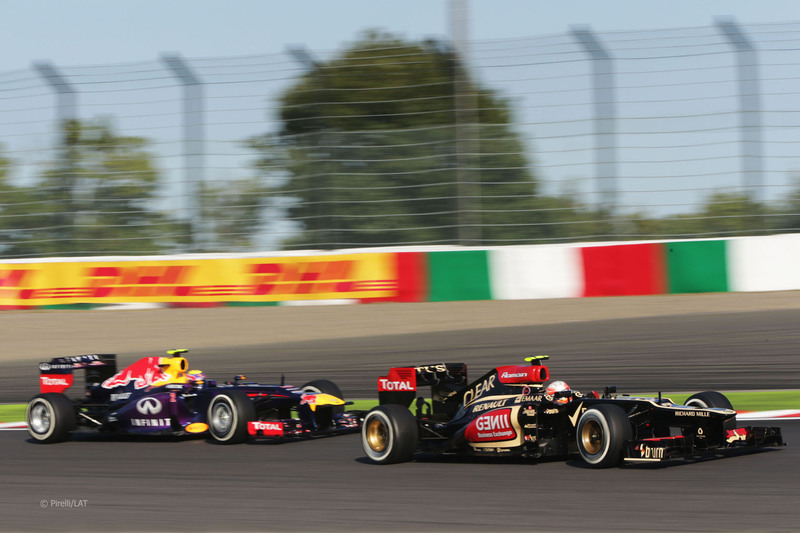 F1 Japanese Grand Prix: Two Stops or Three? This is Sebastian Vettel’s World Championship. The rest of the drivers are just making up the numbers. Of the 21 other drivers on the grid this season, only five have more wins in their careers than Vettel has wins this season. In fact, after winning this weekend’s race at Suzuka, Vettel’s season wins total matched the career win total of his teammate, Mark Webber. I think this fella might be a decent driver. The race started with Mark Webber on the pole for the first time in 364 days. He last pole was last year’s Korean Grand Prix. However, he didn’t lead the first lap. 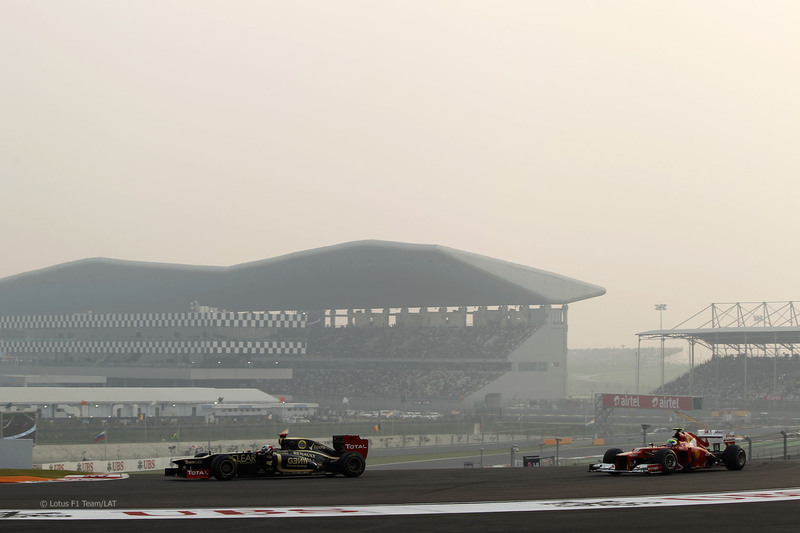 Romain Grosjean had an absolutely magnificent start from 4th on the grid to take the lead into Turn 1. Webber held 2nd while Sebastian Vettel managed to hold onto third despite a challenge from Lewis Hamilton that left the Brit crawling around the track with a flat tyre. The top three ran this through the first round of pit stops. Nico Rosberg was running in fourth until a penalty for an unsafe pitstop release into the path of Sergio Perez ended his hopes of a podium. Upfront, the two Red Bulls couldn’t catch Grosjean for the lead. What they tried is a bit controversial because of accusations of favouritism. Webber was changed to a three-stop strategy while his teammate Vettel matched Grosjean on a two-stopper. Webber cycled through to the lead after everyone’s second stops and Vettel made a power move to climb to second past Grosjean. With 11 laps to go, Webber pitted for a third time to drop to 3rd. Webber was the only car in the top seven to go for a three-stop strategy. Upfront, Vettel cruised away while his teammate battled with the Frenchman. As with Vettel, Grosjean made his car very wide when battling @AussieGrit. Webber used his DRS to make a move into Turn 1 on the last lap. By that point, Vettel had already set sail. The statistics behind Vettel’s win have already been documented. Suffice to say that he could retire on the sale of autographed GP winner memorabilia. 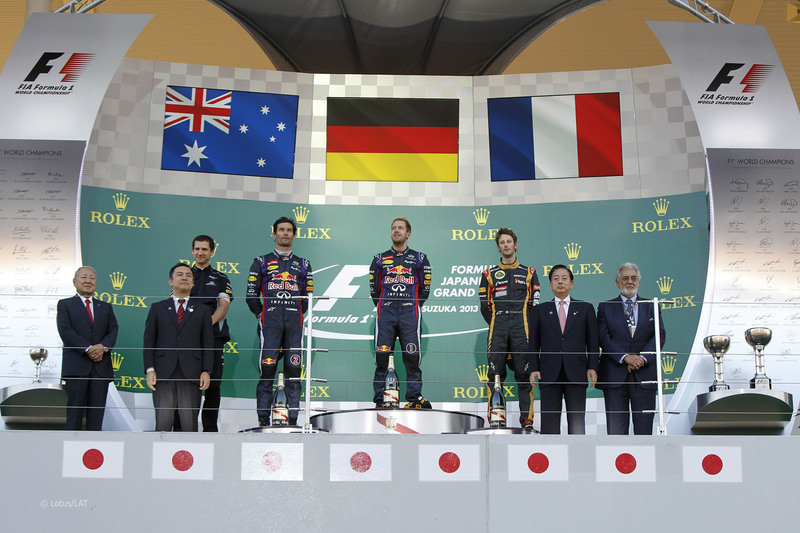 Webber scored the pole and the fastest lap but only managed 2nd thanks to that three-stop strategy. Grosjean rounded out the podium despite leading for most of the day. He hasn’t finished and missed the points since Canada so you can’t say he hasn’t earned a ride somewhere next season. Fernando Alonso finished fourth despite Felipe Massa not letting him through on orders earlier in the race. Kimi Raikkonen put two Lotuses in the top five with his 5th. Nico Hulkenberg finished 6th to lead home teammate Esteban Gutierrez who scored his first career points in 7th. Nico Rosberg was the lone Silver Arrow running at the end in 8th. Jenson Button at least managed to score a win at his home away from home in 9th. Felipe Massa rounded out the points in 10th despite a 5th place start. Vettel’s win at Singapore is coming under question this week. It’s nothing to do with tactics or team orders but an accusation by former F1 team owner Giancarlo Minardi. Minardi was watching the race from a suite in Turn 1 and said that Vettel was able to jump on the throttle about 50 metres sooner than any other car, including that of his teammate. It also sounded like his car had traction control to keep his wheels from spinning. Now, traction control is illegal and prevented by the use of standardized engine control units which prevent teams from changing the engine mapping to add traction control. However, Racecar Engineering believes that there is a way to create a trick setup with the KERS unit and suspension to create a sort of traction control. 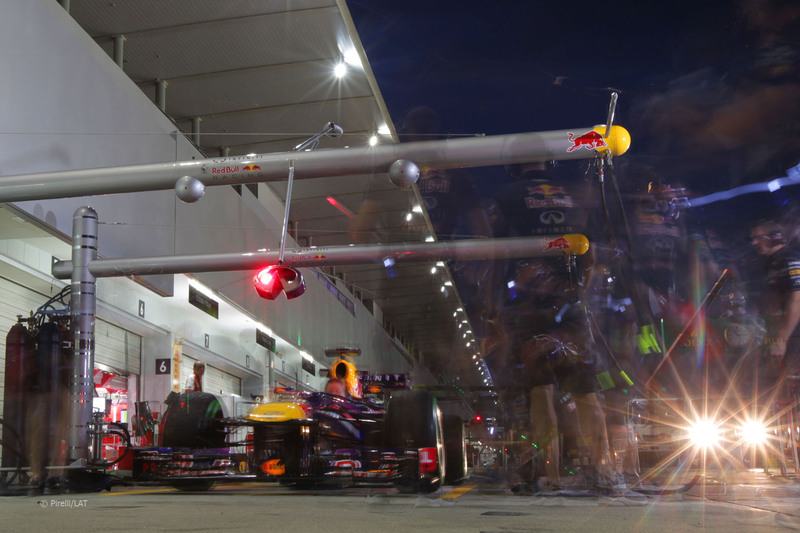 Their theory is that Red Bull are using feedback from sensors to get the KERS unit to prevent unused traction potential (wheel spin) by initiating recovery of the excess energy at the wheel. Apparently it’s easy to do and legal. I think the more non-technical way of explaining is when the car’s sensors detect wheel spin, the KERS tries to recover energy which reduces the torque pushed to the rear wheels which keeps the wheels from spinning. FIA Technical Regulation 9.3 is written in such a way as to outlaw anything that can prevent wheel spin from occurring. However, as was the case pre-2002 when traction control was reintroduced to the sport, it’s very hard to prove that a team is using traction control. Since they couldn’t detect it, the FIA just opened up F1 to traction control until the brought in standardized ECUs. Unless the FIA can prove that Red Bull is doing something illegal with their supposed trick KERS setup, it’s fair game for them to continue. Still, this does make for some interesting hindsight analysis. Red Bull has had numerous KERS issues over the last few years. These problems have often been put down to Adrian Newey trying things to make the car as fast as possible by minimizing the cooling, weight and weight balance issues caused by KERS. Perhaps, it’s because of the demands placed on the Red bull KERS unit by this makeshift traction control system. Can I take a quick moment to slag off TSN again? This week, we actually got a replay. However, they cut the event down to two hours to fit in their time block. That means the five-minute BBC pre-race before the formation lap, the race itself and the podium and interviews are cut into a two-hour chunk of time complete with four 3-minute long ad breaks per hour. If TSN was trying to cram this into a busy Sunday line-up, I’d understand. However, their Sunday line-up was F1 followed by 3 hours of SportsCentre, a magazine show, a month-old boxing show, more SportsCentre followed by F1 again which was followed by two hours of taped CrossFit Games. That’s seven hours of nothing from the end of the first replay to the start of the second. You couldn’t squeeze a SportsCentre by 15 minutes to give everyone the whole race? TSN’s disdain toward open-wheel racing fans has been apparent for a long-time. I’ve mentioned before how they’d often go out of their way to put IndyCar on at the most inconvenient times possible whether they could squeeze it in live or not. During the European portion of the season when it’s possible to catch the races live in the Eastern timezone with only mild sleep deprivation, it’s not that bad that TSN doesn’t care. During flyaway races when races are overnight, TSN stops being an official broadcaster and being the Canadian F1 fan’s chief antagonist. Booing TSN management would be far more appropriate than booing even Michael Schumacher at the height of his team order aided dominance. 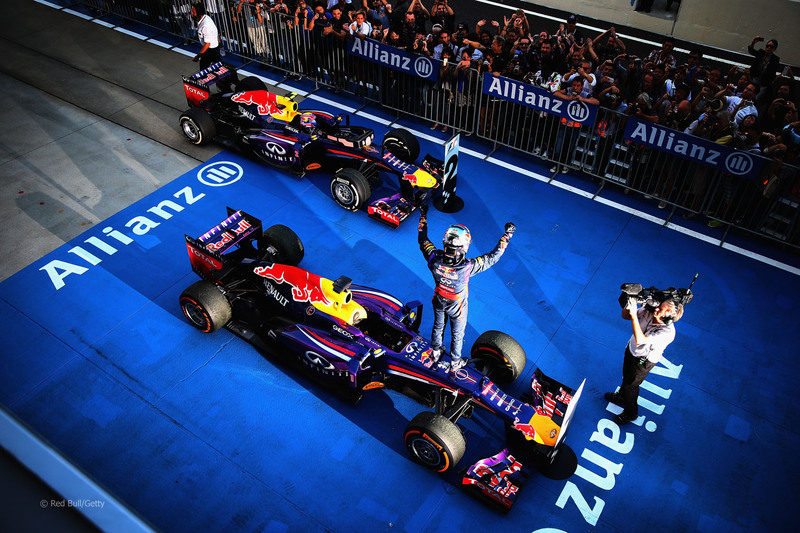 The next round of the 2013 Formula One World Championship may be the last one that matters. It’s the fourth-to-last race and leaves Alonso in effectively a must-win situation as the circus moves to India for the third Indian Grand Prix. With Vettel on an absolute monster roll of five-straight Grand Prix victories and having been the only winner of this race in the previous two runnings, it’s hard to bet against the German this time out. The only one that needs to challenge him is the Ferrari of Fernando Alonso. The question for the next race is whether he can challenge Vettel.